As it’s SO cold here, I just had to knit a hat for myself too. The pattern is out of a lovely book called “Sock Yarn One-Skein Wonders: 101 Patterns That Go Way Beyond Socks“… at least I think it is. I noted it down so long ago, that I can’t really remember where I found it. Also I had to modify it somewhat, as it origianlly was designed for gloves. Doesn’t it make a lovely pattern for a hat too? The yarn is Schachmayr Bravo Big, which I got on sale shortly before Christmas. 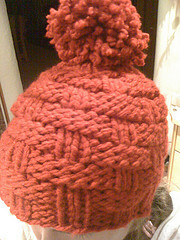 It is cosy and warm, but was a real pain to knit. I don’t think I’ll work with it again. 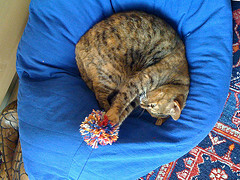 Oh and here is Kitty having fun with the extra pom pom I made just for her out of some old left over sock yarn.